I am selling the collection of my friend who is, being a fan of Bob Dylan, was collecting the records for a long time, selecting each example very carefully. Please see the other Bob Dylan's records currently listed on my auction. 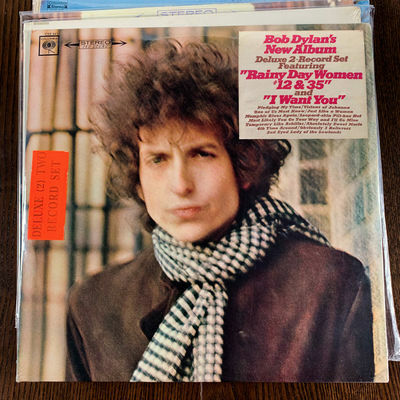 This copy of Bob Dylan Blonde on Blonde, his 7th studio album with C2S 841 catalog number, issued in 1966 on Columbia Records is still fully factory sealed. I can't say for sure, but I think it's the 1st pressing withdrawn cover with 9 photos, including a photo of Claudia Cardinale. The reason why I think so is because as far as I know the hype sticker was present only on the 1st pressing of this album. Intact shrink without splitting, including the corners, only the bottom left corner has light signs of wear. Shiny shrink without ring wear. Besides the hype sticker located at the upper right corner of the front cover, the album also contains an orange Two Record Set sticker on the shrink, which is very characteristic of the first pressing. Very heavy issue weighing in at more than 400 grams.